India vs Australia 4th Test Sydney: Rishabh Pant and Ravindra Jadeja's blitz help India get to a mammoth 622/7 before India declared their first innings. India vs Australia 4th Test Sydney: Rishabh Pant and Ravindra Jadeja’s blitz help India get to a mammoth 622/7 before India declared their first innings. Both the cricketers played a few audacious shots in their innings. 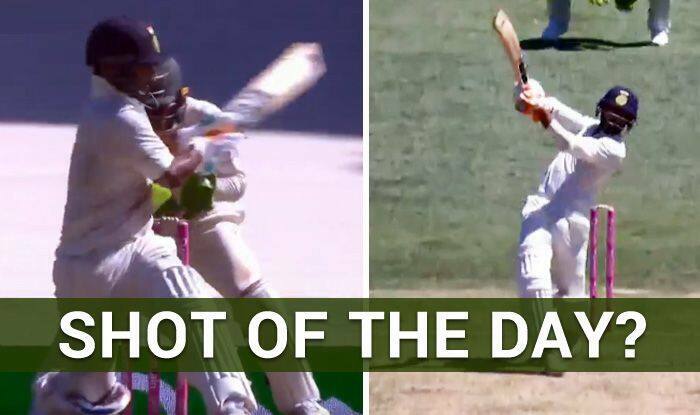 But, two shots from the individuals that stood out was Rishabh Pant reverse-sweeping Nathan Lyon and Ravindra Jadeja smashing a pacy Pat Cummins for a huge six in the cow-corner region. So, which one is your favourite, both, for starters were audacious and un-Test-match-like! They played those shots when India was in the box-seat and they had the license to go hell-for-leather. Here are both the shots. The duo put on a 204-run-stand before Ravindra Jadeja was finally out for 81, 19 runs short of his second Test ton. Meanwhile, Rishabh Pant remained unbeaten on 159 off 189 balls. Pant’s innings was laced with 15 fours and a six. Jadeja’s 81 will also give him confidence when he bowls to Australia on Day 3. By getting a huge first innings total, India seems to have ensured the Border-Gavaskar Trophy has been retained and it is coming home. Now it is over to the bowlers to pick the remaining 20 wickets. Earlier, it was Cheteshwar Pujara’s gritty 193 that set the platform for India. The Saurashtrian became only the third India batsman to score 500+ runs in a Test series in Australia. He joined Virat Kohli and Rahul Dravid to this feat.